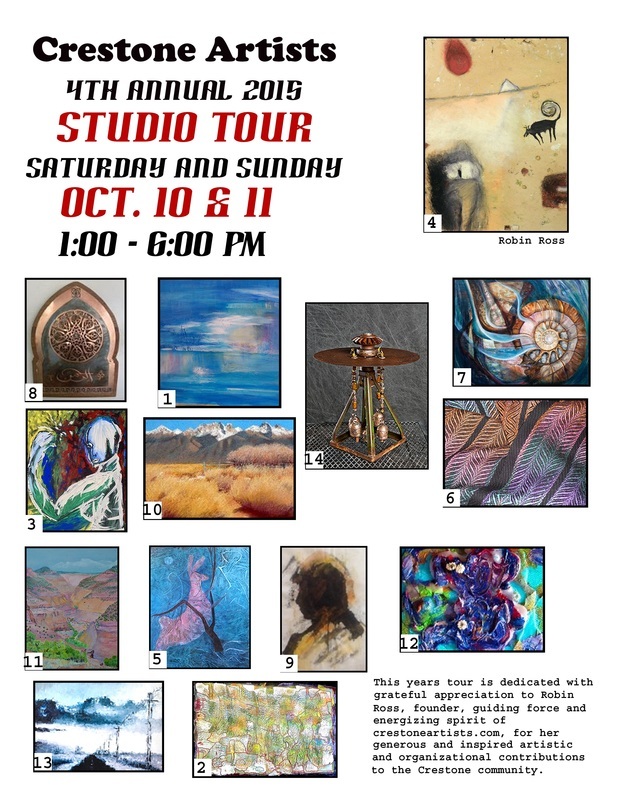 This year’s Crestone Artists fourth Annual Studio Tour will feature 14 of our community’s artists whose work and subject matter cover a diversity of visions, styles and materials. Scheduled to take place October 10 and 11 from 1 to 6 pm and with the designation of Crestone as a Colorado Arts District and the support of many sponsoring members of our community, this wonderful event offers an opportunity to introduce our artists and community to visitors to Crestone when our mountains and environs are at their loveliest. A perusal of other tours throughout the state suggests that while Crestone artists include a wide range of sensibilities and visions, not surprisingly, unique to our community is a strong sense of the spiritual, the contemplative, the celebratory and the visionary. Included in this year’s tour are the otherworldly, totemic and dreamlike landscapes, resonant with deep space and time of artists Robin Ross, Jennifer Thomson, Mae Green, Beatris Burgoin and Barbara Dose; the exploration of the “innersacapes” of the human figure in the work of Jane Kwan and Brenda Sue; the more literal and classically beautiful celebrations of the natural world in pastel and watercolor by Emmy Savage and Joanne Kiser; the luscious, playful and provocative celebrations of vision and materials by Verena Schwartz, Stephen (Ish) Futral, Rose Burek and Kim Roberts; the sumptuous weavings of Moira Forsythe;and the magnificent copper works of Shahna Lax that so effortlessly integrate intellectual, mystical and aesthetic imperatives. This year’s tour is dedicated with grateful appreciation for Robin Ross, founder, guiding force and energizing spirit of crestoneartists.com and for her generous and inspired artistic and organizational contributions to the Crestone community. Her death in February was a terrible loss to our community but her generous spirit, her passion and gentle support continue to sustain all of us who are participating in this year’s tour. For brochures with the names of local sponsors and maps of this year’s tour look in our local businesses or go to crestoneartists.com/studio tour.